Below you see the components of the Makey Makey kit. It will need to be attached to a computer in order to operate. 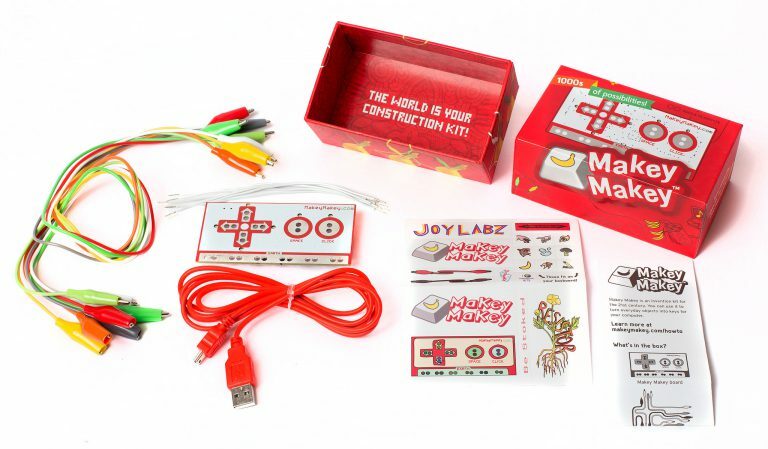 With the Makey Makey kit you can turn everyday objects into touchpads and combine them with the internet. It’s a simple Invention Kit for Beginners and Experts doing art, engineering, and everything in between: How Does it Work? Alligator Clip two objects to the Makey Makey board. For example, you and a banana. When you touch the banana, you make a connection, and Makey Makey sends the computer a keyboard message. The computer just thinks Makey Makey is a regular keyboard (or mouse). Therefore it works with all programs and webpages, because all programs and webpages take keyboard and mouse input. The video belows explains a bit about what the kit can do. These devices are not generally set out throughout the entire day. The library may set up the mobile station for specific hours during the week or may check it out for in-library use.